You are currently browsing the tag archive for the ‘Irish Statues’ tag. Good news greeted me upon my first glance at the Dublin Airport Authority website this morning – a website I have spent far too much time with this week! Dublin Airport Fully Operational. In what I think is a small window of opportunity during a brief lull in Ireland’s continuing severe weather advisory, Declan’s flight left the ground today, a mere 45 minutes late and is expected to arrive at O’Hare a bit early! After three days spent hoping and waiting at Dublin Airport I know an exhausted Declan will be so happy to be back that he won’t even mind the real cold that will greet him in Chicago. And as there is always a silver lining in every cloud, Declan had the good fortune to make new acquaintances during his ordeal at the airport and to even experience the unusual coincidence of running into Elmhurst friends, now living in Wisconsin, who were also stranded, trying to make their connection from London to the same Aer Lingus flight that has kept Declan waiting for so long. Last night they all enjoyed a well-earned evening at the pub, which by the background sounds I heard while talking to Declan on his mobile, was full of laughter and more than a few pints of the black stuff! Another silver lining in this cloud of Irish severe weather, is that it has given me an excuse to share a photo of one of my favorite Dublin statues, covered with snow. 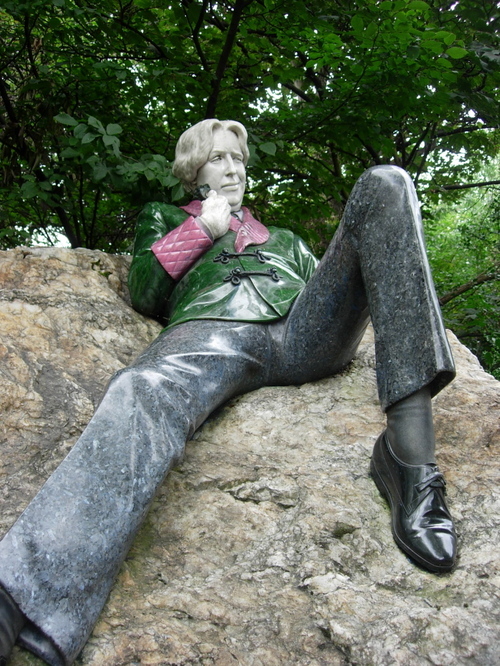 This statue of the Irish writer/poet, Oscar Wilde, resides in Merrion Square. Like most statues in Dublin, Oscar has been given the usual array of humorous and irreverent nicknames, which I will refrain from including here, for fear that a few of my readers would not understand the affection usually attached to Dublin nicknames. It is my opinion that the sculptor, Danny Osborne, has managed to perfectly combine the respectful and weighty tribute of a representation in marble with the personality and flamboyance of Mr. Wilde himself! Whenever I come upon this statue I cannot help but stand there smiling for a while admiring the use of colorful marble carved into such a casual and vivacious form of this man who was so talented, yet so persecuted and disgraced in his lifetime. 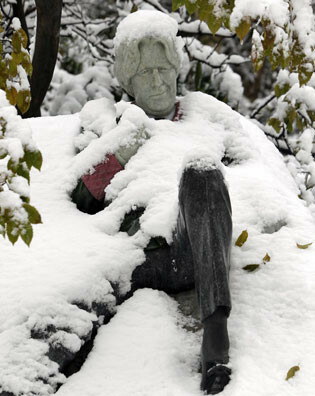 The fact that this statue of Oscar Wilde is now proudly displayed in such an important Dublin park, is a testament to the likelihood that the prejudices and inequalities that we still cling to today, will one day be looked upon with disbelief and scorn. Always, after passing Oscar Wilde in Merrion Square, the rest of my stroll is in the company of Mr. Wilde’s ghost – cheerfully walking along the footpath, arms swinging and head held high, completely unaware of my presence. In all probability, Declan’s arms will not be swinging nor his weary head held high when he returns home after a grueling three days of waiting in Dublin Airport. However, I know he will think it was all worthwhile in exchange for the time he was able to spend in Kilkee and Dublin, and for the fun he had with his fellow stranded passengers yesterday, all of them making the best of a bad situation. And at least, now that it’s Friday, he has the weekend to relax and recharge before getting back to work on Monday morning!